Good morning fam! 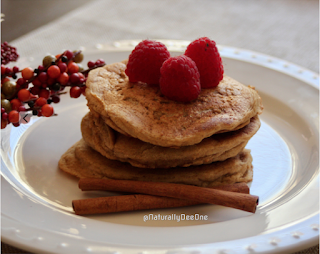 Today, I'm going to share with you, my Vegan, Gluten-Free Pumpkin Spice Pancake recipe. ‘Tis the season for pumpkin! And you’re going to enjoy this vegan recipe, even if you're not a pumpkin eater or a vegan—it’s simple, healthy, and delicious! Simplicity and taste, as well as health, were my focus in creating this recipe. We understand that not everyone aspiring to eat a vegan or plant-based diet is doing so for ethical reasons—at the end of the day, we’re all vegans and we're making the world a better place. To achieve that, teaching people how to make tasty foods is always helpful. To go a step further, my recipe goal is to keep the vegan/plant-based recipes as simple as possible with a short to medium list of ingredients that are easy to find and pronounce. So, if you don’t have these items already, get to the store right now and start shopping for them. You can also order your ingredients online. Turn the non-stick griddle on to 275 degrees Fahrenheit. Add the pumpkin mixture to the large bowl with the dry ingredients, then mix well with the whisk. Using 1/4 cup of batter per pancake, pour the batter onto the hot griddle or frying pan to make 10-12 pancakes. Serve with your favorite toppings and/or syrup. Enjoy! I hope you enjoyed this delicious vegan gluten-free pumpkin spice pancake recipe, which is great for the autumn holiday season—Halloween and Thanksgiving (and even Christmas). ‘Tis the season! Let me know if you want more pancake recipes and if you enjoyed this gluten-free, vegan one. For more vegan recipes and/or ideas, check outthese books or check out my book. Have an awesome day and talk soon!